A photographer with vitiligo has embraced her look and empowered others with the condition to do so too, thanks to her grandmother’s dying words that she needed ‘tough skin’. Jasmine Colgan, 27, from Denver in Colorado, USA, broke down in tears after finding a white bean-sized spot on her inner thigh and speck on her wrist six-years-ago. She underwent 20 laser treatment sessions in attempts to reduce the pigment-devoid areas that but it continued spread over most of her face, her full hands, feet and parts of her body. Even in swelteringly hot conditions the student hid the discoloured patches of her skin under clothing after being cruelly told, ‘it must be hard to look in the mirror’. But remembering her late-grandmother Regina Longcor’s encouragement, she started to embrace her body by documenting her vitiligo in photographs. Jasmine turned her skin into an art, snapping detailed shots of the chalk-like patches and spots on her body to start appreciating its unique beauty. 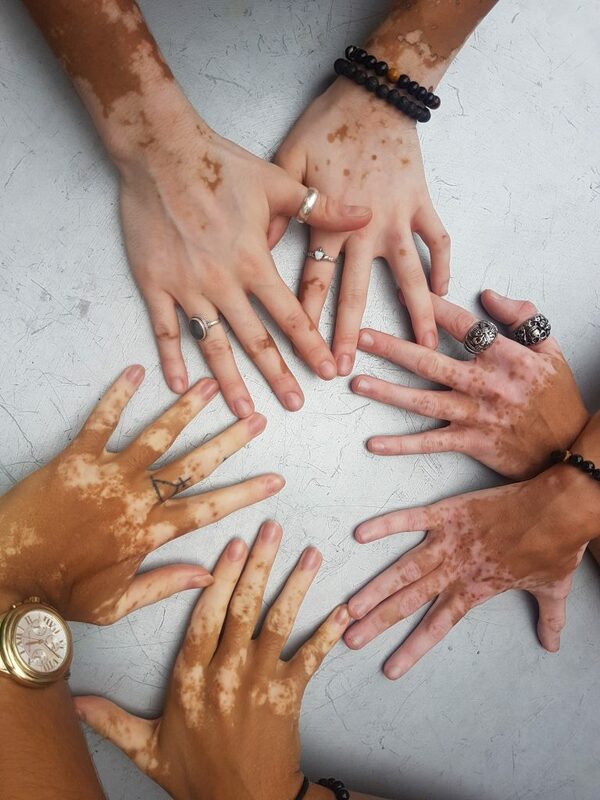 Now she’s travelling around the US meeting others with vitiligo, which affects 1% of the world’s population, taking photographs of their skin to empower them too. 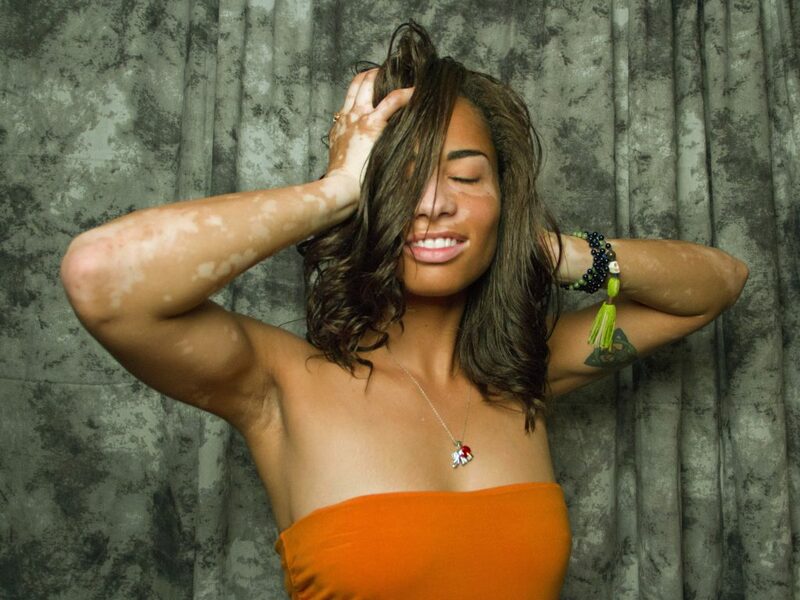 Jasmine, a photographer, said: “I was depressed for a really long time, I didn’t know how to feel about my vitiligo and unknowingly I was covering my skin, keeping it hidden from the world. 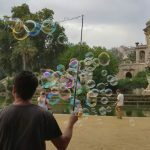 “When I realised I had been wearing long sleeves and had stopped wearing shorts, I didn’t want to hide behind layers anymore and act like my skin was a burden. “In the past, I had tried laser treatments and everything to cover-up, but my Grandma was right, I needed to have ‘tough skin’. 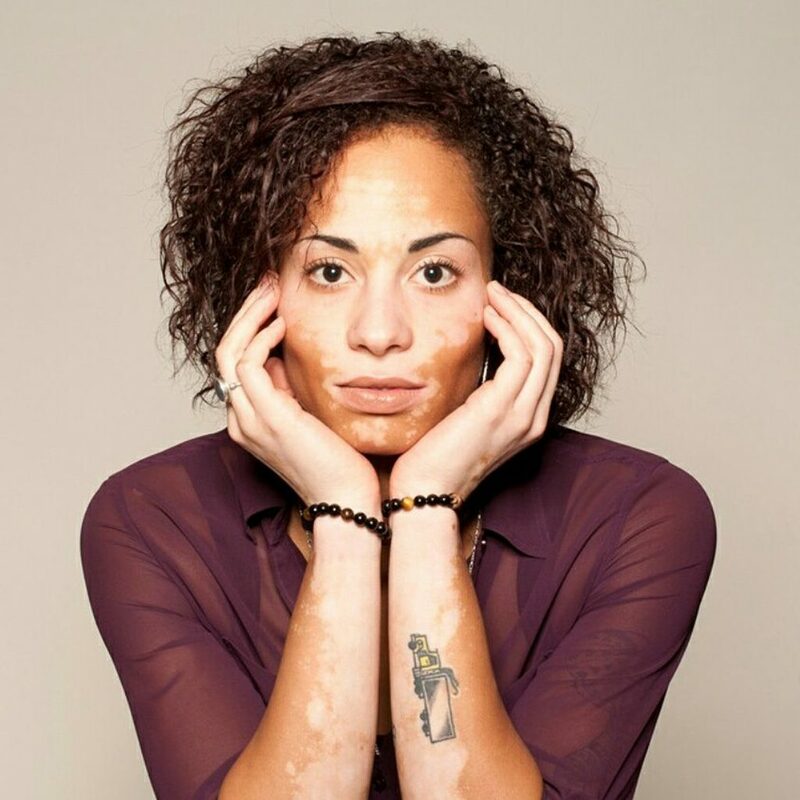 “From then onwards, whenever I became really sad about being different I would photograph my vitiligo and kept a personal journal, it became a way to heal myself. “It helped me to appreciate that this was just skin, it wasn’t something that was going to kill me and I loved its beautiful unique characteristics. “Looking through the photographs made me feel more comfortable and accepting of myself, I felt empowered and like a role model, which I embraced. 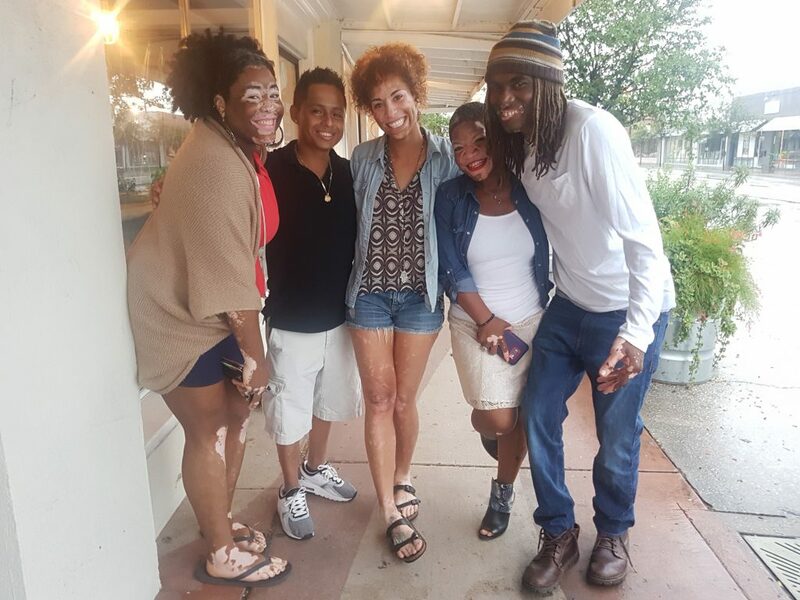 “After accepting myself, I wanted to see other people patches and skin tones so I started reaching out to people within the vitiligo community. “In the past 12-months, I have learned to accept my skin and help others feel the same through travelling to meet them and taking pictures of their skin too. 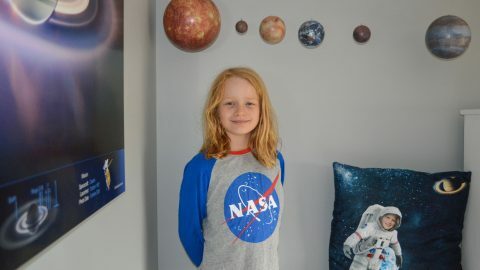 Jasmine initially struggled to come to terms with the pigment-free patches expanding over her body, after being diagnosed in 2011. 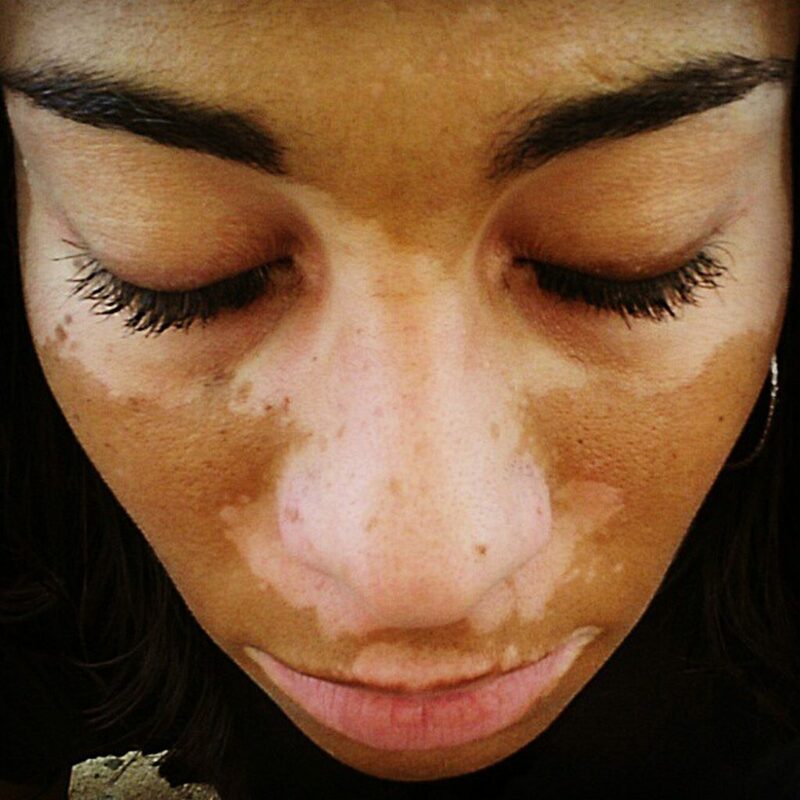 Not knowing anyone else with vitiligo she felt alone, embarrassed and tried to hide the changes with long layers and unsuccessful treatment. Jasmine said: “When I was younger I used to have beautiful brown skin, I was doing modelling and all of this stuff but when I was diagnosed with vitiligo I hit the ground. Nothing worked to reduce it and the death of Jasmine’s grandmother brought the vitiligo on even more as it spread to her face and other body parts. 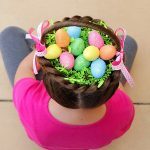 Over time, she started to accept that she had the skin disorder thanks to the empowering and strong words her late-grandmother told her. Jasmine said: “After researching how vitiligo would make me look I cried, but I called my grandmother who was on her deathbed and she told me ‘You gotta [sic] to have tough skin’. “It took a while to sink in, but ever since then her words have inspired and influenced every step I’ve taken in becoming who I am today. 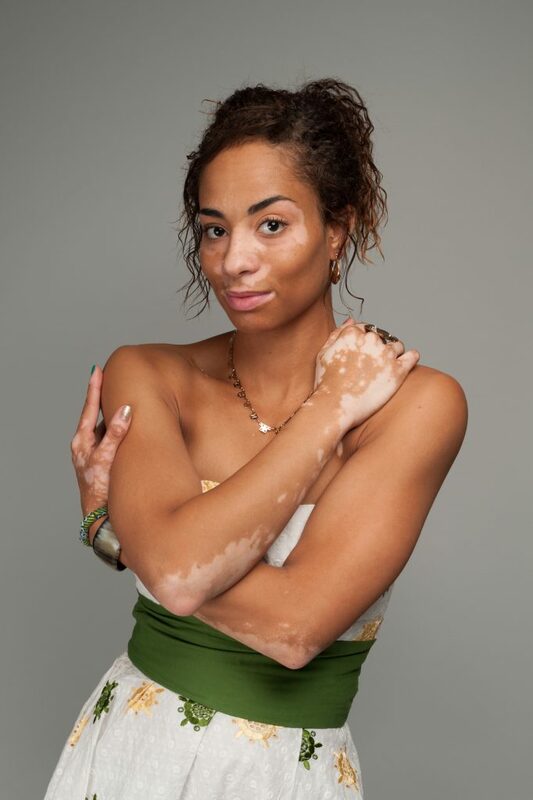 In 2012, Jasmine started documenting her vitiligo for an art project, which helped her to see her skin as art and not something to be ashamed of. As she learned to accept herself, she faced cruel comments from ignorant members of the public but eventually she started to speak out about the skin disorder. 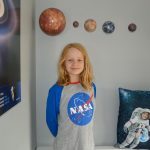 Jasmine said: “There have been countless times where I have felt bullied for the way my skin is different, but the more empowered I have become the more I would challenge it. “Once after I explained my condition to one guy he said ‘Wow, it must be really hard to look in the mirror. Since then, she’s become an ambassador for vitiligo by talking at conferences and informing people while out in public. Jasmine added: “I think after that guy made the ‘hard to look in the mirror’ comment I wanted to prove him wrong, so now if I catch anyone staring at me, I smile and wave back. “Whenever I can I try to educate people by telling them it’s not contagious, you cannot catch this and I give them a hug. Jasmine started her project ‘Tough Skin’ based on her grandmother’s inspiring words to change other people’s perspectives too. 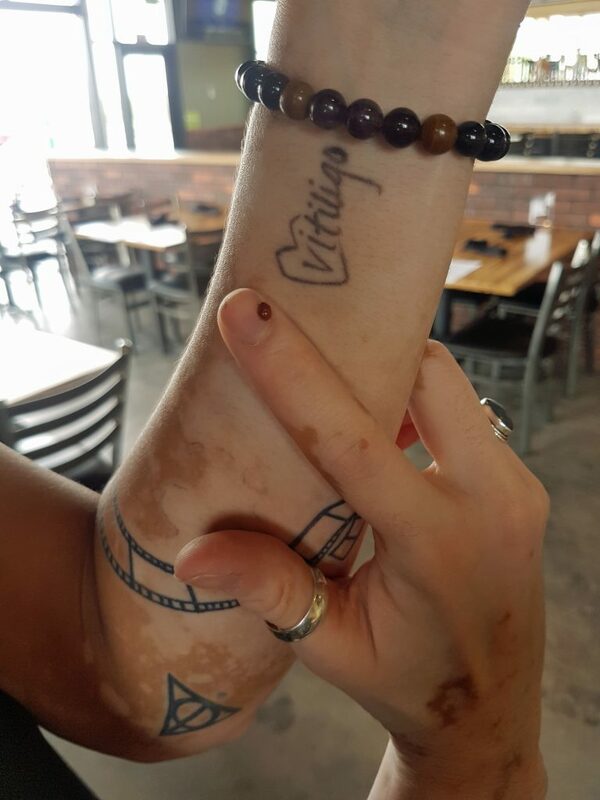 She said: “The project shows a bare minimum of the person’s identity and a lot of their spots, to replicate the way the public sees people with vitiligo. “Documenting my skin started as a school project, but after I eventually had the courage to show family and friends their reactions made me feel even more empowered. To see her work visit here.